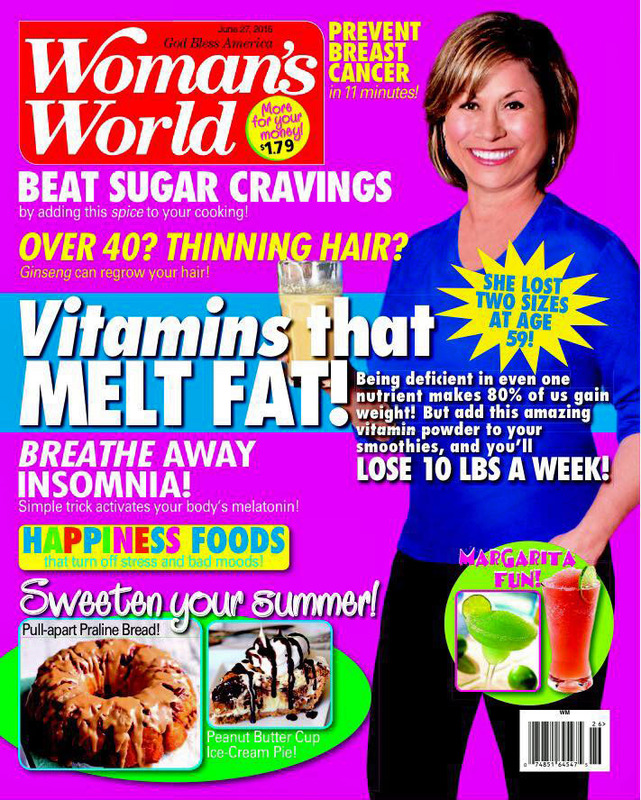 We shared with you last week that one of our fabulous CMS, Micki Daniel, was going to be featured in Woman's World magazine. If you didn't get a chance to pick up a copy for yourself, we are so happy to share the full article with you! 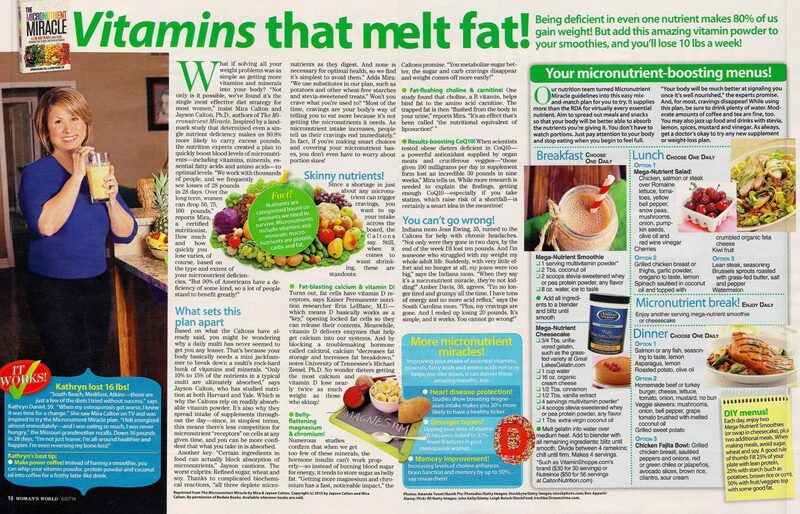 In this article titled, ‘Vitamins that melt fat', Micki shares her Micronutrient Miracle story, and we were able to share a little bit about what sets our plan apart. It even includes a sample meal plan with our triple threat smoothie, and triple threat cheesecake recipes. While getting an article in a major magazine is exciting don’t be mislead. The Micronutrient Miracle 28-day program is not purely a weight loss miracle solution as the article may lead you to believe. We do not promise miraculous weight loss. Chances are that you will get your body to a healthy weight while on the program, but there is so much more to it than that! Even Micki herself shared that while she was leaner and healthier after just 28 days, the bigger and more important factor to notice is that she was reversing her bone loss. It is about health. And your getting healthy will take some work and dedication from you as well. We are not promising miracles. There is no magic pill or potion in the book. In our practice as celebrity nutrition and lifestyle medicine experts, the amazing results our clients experience are not true miracles. 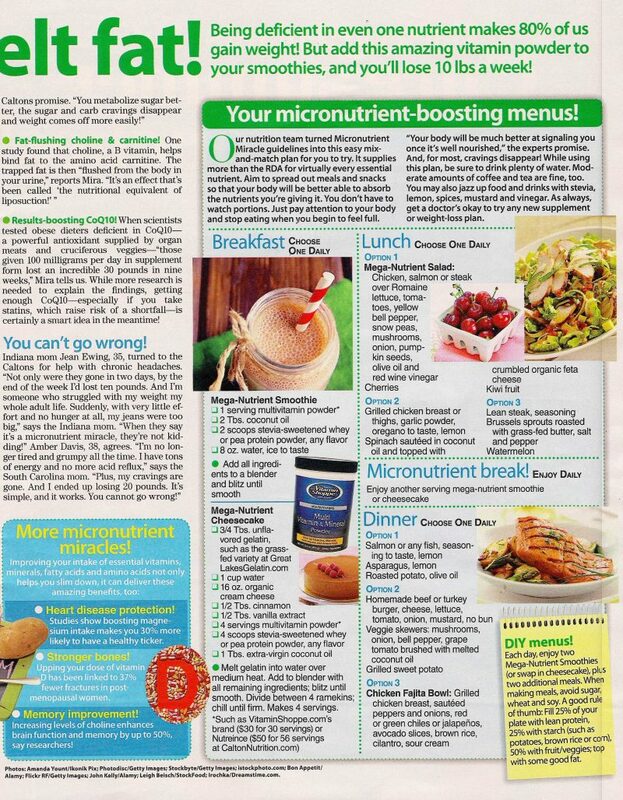 In fact, the powers of the essential micronutrients are very well documented in scientific journals. It is the human body’s ability to use these micronutrients to prevent and reverse nearly all the health conditions and lifestyle diseases currently plaguing billions of people across the globe that we find truly miraculous. 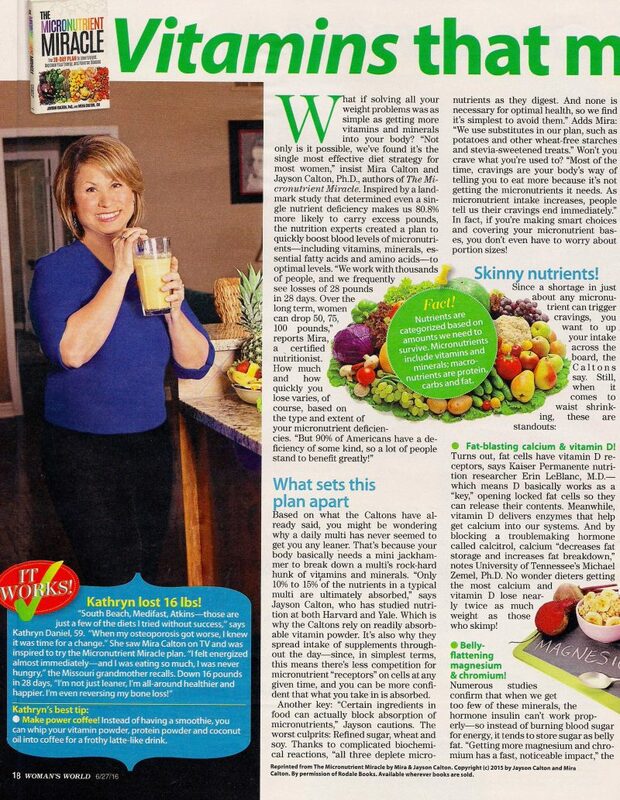 Additionally, you can see in the article they show vitamin shoppe brand vitamin drink. We would obviously not recommend that as a supplement due to the fact that in fails our ABCs of Optimal Supplementation Guidelines in numerous ways. Not only is it a single serving powder that becomes oxidized due to it being delivered in a canister, but all the nutrients combined inside contain a ton of antagonisms.. they don’t know a thing abut anti-competition technology! Then you have to consider that it doesn’t contain hardly any of the nutrients you need (only supplying in many cases 1% of the DV) and the wrong forms of many nutrients (folic acid & cyanacobalmin-YUCK!). We cant believe that photo of that product is even in the article. We do not support anyone choosing this product. You should ALWAYS test the product utilizing the ABCs of Optimal Supplementation Guidelines, and that product would fail! What do you think? We'd love for you to pick up a copy of The Micronutrient Miracle and join us for our next VIP coaching group! What will your miracle be?